Men's Topwater Vest is rated 4.3 out of 5 by 81. Light in weight, heavy on warmth. Water-resistant, too, so rain and spray won't get the best of you. Throw one in the boat and you're covered! 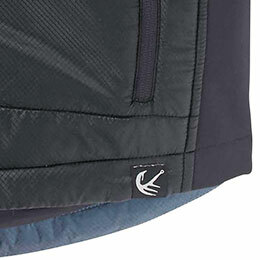 Ever wish your vest had the same easy-moving stretch panels that your fishing shirt does? Your wish has been granted. 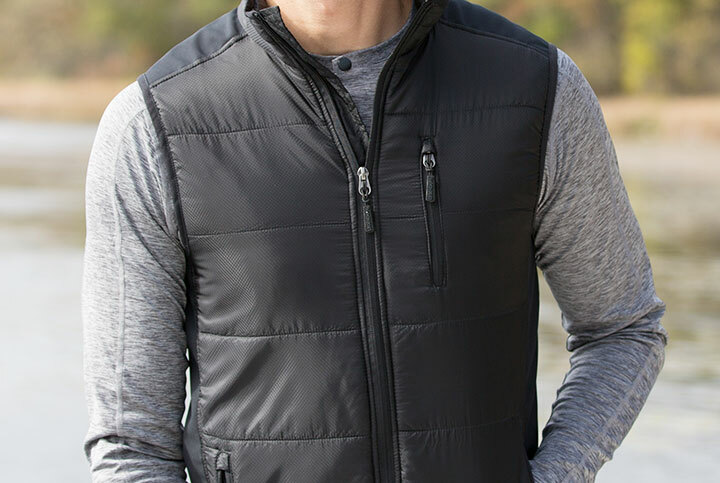 This lightweight, Full Zip men’s vest offers core warmth on the water. Stretch side panels and contrast details give this fishing vest an updated fit and look, while heat retention technology and a water-repellent finish keep the elements at bay. 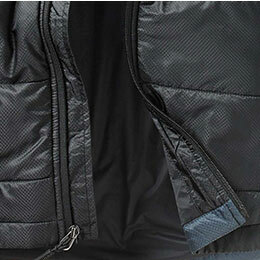 A zip chest pocket and two hand pockets offer storage options. Legendary® Anglers label at hem. Rated 5 out of 5 by Jeff from Well worth the purchase!!!! 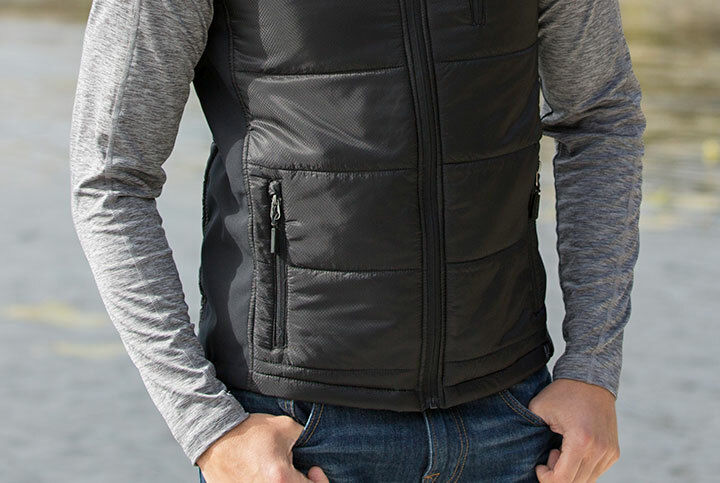 This vest is super comfy, not bulky at all and very warm. Definitely recommend !!!! Rated 4 out of 5 by Joe P from Nice but one small issue Love that vest is thin and light weight. Glad I order one up in size. Had to return vest due to hole in right pocket but legendary customer service was great again with correcting the issue. Rated 1 out of 5 by Marie from Alabama from Lightweight and warm I bought this vest for my husband and he really likes it. I decided to order one for myself because it is lightweight and Just what I wanted for the climate in Alabama. 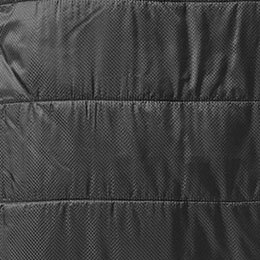 Rated 5 out of 5 by tkline from Nice vest When I got this vest my first though was it was very light weight and not insulated like I anticipated. It turns out it is very nice for wearing under jackets and even around the house because it keeps your core warm. Great vest. Rated 5 out of 5 by TCK2 from ALL AROUND GREAT VEST. THE VEST IS QUITE THIN, BUT TO OUR SURPRISE IS VERY WIND RESISTANT. WORE IT WITH A LEGENDARY WHITETAIL FLANNEL, ON A DAY THE TEMP. WAS APPOX 37 DEGREES, AND WINDY. DID NOT SPEND THE ENTIRE DAY OUTSIDE, BUT WAS OUT FOR APPOX. 2-3 HR. AND WAS JUST PERFECT. I WOULD RECOMMEND THIS VEST FOR JUST ABOUT ANY OCCASION, TO AND FROM WORK, TO THE LAKE, OR A DAY TO JUST DO CHASING. IT IS ALSO THIN ENOUGH THAT I WILL WEAR UNDER A LEATHER VEST ON COLDER DAYS TO KEEP THE WIND OFF OF ME. Rated 3 out of 5 by Justin from Looks heavier online I like it but in photos it seemed thicker and kind of puffy. The material is pretty thin. No inside pockets like I wished for. But not bad i guess. Rated 5 out of 5 by Trudell Outdoor Adventure from Light and Warm! This vest is amazing! When I opened it I thought it was too light weight, but once I put it on I was amazed at it's warmth! Light and warm, very nice looking too! Rated 5 out of 5 by Skute from Everyone Needs One of These! I bought three of these for family members and they all loved them. I ordered black since they go with more shirt colors. 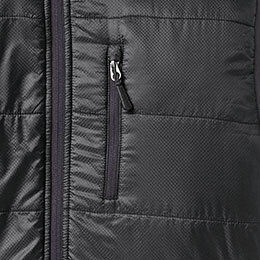 They are warm, yet thin and not bulky like most other vests. They wash well. You won't go wrong if you decide to purchase one of these. They are awesome! Rated 5 out of 5 by Dave from Nice vest Good quality. Its not too thick, so more for cool temps. Rated 5 out of 5 by Jeff from Would Definitely Buy Again! Very Light Weight, Warm and Comfortable. Great Product! Rated 5 out of 5 by Kent from Great Style and Comfort Bought during a promo sale. Love the comfort. Good length on the XLT but not too long. I'm 6'5". I like to wear over a polo at work. Works great to help to conceal while carrying. Got lots of compliments. Rated 5 out of 5 by Purple Pat from Great value My husband loves this vest. It is so soft but keeps him very warm. Rated 5 out of 5 by Gary from Great vest!!! Great fit! I love the extra long option. Light weight and keeps in the heat in the winter without all of the bulk. Rated 3 out of 5 by Ángel from Nice ! but small for my regular size . Size M runs small for me ,but my 15 years boy love it ! Rated 4 out of 5 by Bilran from Lightweight but warm. I needed an in between weight vest, this one works well. It is warm for its weight which surprised me. Great for layering or by itself. It does run a tad small. Rated 5 out of 5 by Dom J from Great fit Great fit and looks awesome. Glad I went with the tall size. Would buy again in other colors. Rated 4 out of 5 by Steven from Great vest So light and thin you don't know you have it on, yet warm. Rated 5 out of 5 by Carol from Great for BOTH women and men!! I bought this vest for myself because I wanted a longer vest for over big sweatshirts. I have a womens shorter one, but I prefer this one. I love it. Exactly what I wanted. Fits great and warm. Rated 5 out of 5 by Tyler from Perfectly Fitted Vest I’ve been looking for a vest that isn’t clunky and fits well around the waist. This vest sn’t thick, pockets are well placed, looks sharp! I will be buying again! Rated 5 out of 5 by Vsos from Won’t Bog you down Lightweight comfort makes this vest perfect for use everyday and river day. Rated 5 out of 5 by Dave L from Pennsylvania trail runner Best trail running vest ever. Super light weight, comfortable and warm with three zipper pockets. I can run all winter in this vest. I am 6'2 and 190 and the size Large fit perfect. Rated 5 out of 5 by Zelly from Super warm vest, but runs small Wore this vest out walking the dogs in 19 degree weather and kept me super warm. I would recommend sizing up, especially if you plan to wear something thicker underneath.